Pokemon Go! – maybe you’ve heard of it. And why not? It’s fun, challenging, and mobile-friendly. That’s the upside of technology. However, there’s been a downside – the adverse effect on your neck, shoulders, and upper back from constant playing. Even if you don’t feel much pain, you could be developing a chronic issue. 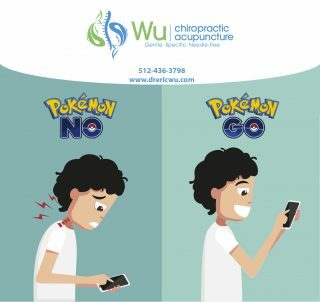 But there is hope – Wu Chiropractic & Acupuncture, where Austin chiropractor Dr. Eric Wu can alleviate your chronic neck pain with a personalized chiropractic treatment plan as safe as it is effective. Legions of people are reporting chronic pain in their necks, shoulders, upper back, and arms more than ever before. Mind you, these are not football players, wrestlers, or extreme sports enthusiasts, either, but people in their 20s, teens, and even younger who don’t do much physical activity. They’re simply spending hours on their mobile devices in “couch slouch” mode or in “engaged” mode – leaning forward, elbows on knees, and head tilted awkwardly as they play for hours every day on their tablet, smartphone, or laptop. The human body was designed for your head – all ten pounds of bone and tissue – to sit atop your neck and shoulders in the proper, untilted position that your neck and shoulders can easily support. But hours in a slouch with your head tilted forward at more than a 10% angle from vertical will cause pain. Do this daily, and it becomes chronic. Wu Chiropractic & Acupuncture says “No”, not “Go”, to this. A major problem for Pokemon players is desensitization. Once into their game, they forget everything else – eating, drinking, using the bathroom, even bathing! Some players who endure a health issue when not playing, as in a toothache, often report feeling no such pain while in the middle of their Pokemon bender. Others who do feel pain during and after their gaming session try to alleviate it with a massage, painkillers, or maybe a doctor’s visit for treatment. However, this doesn’t eliminate chronic pain. If DIY pain management doesn’t help, consider chiropractic care. A specialist like Dr. Wu will find out the nature of your pain and your habits. After this, you might have x-rays, and then you’ll get a report on the condition of your spine and a suggested treatment plan. A typical plan is designed to eliminate your pain as well as restore your normal range of motion. Next might be a specialized treatment stage to heal the affected muscles and tissues. Finally, there’s the maintenance stage – adjustments to help you deal with or even avoid future problems. For the best in Austin chiropractic, call Dr. Eric Wu at 512.436.3798 or visit Wu Chiropractic & Acupuncture to schedule a customized consultation.